Water soluble powder made by cold pressing chia seeds and then gently heat extruding the partially defatted cake. 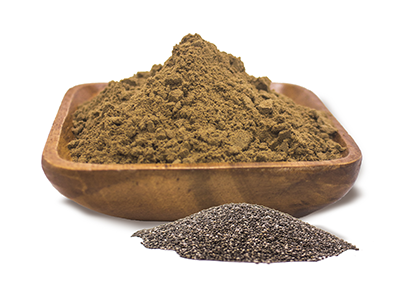 Chia instant powder has a better digestibility than chia seeds and chia flour. The controlled heat extrusion process improves digestibility by reducing the anti-nutrients that the chia seed have such as phytate or phytic acid which is an antinutrient that binds to many minerals such as calcium, iron, zinc magnesium and copper which ultimately makes them unavailable for absorption. Also the heat extrusion is a kill step that ensures food safety peace-of-mind. 30% plant based protein easily digestible will all essential amino acids in ideal balance. High in dietary fiber and omega 3. Significant source of Calcium. Combine with juices, smoothies, water, yogurts and granolas. The protein + fiber + omega-3 + calcium makes it an ideal ingredient in sport nutrition formulations and nutrition bars. Can be used in a wide range of functional food applications where low carb, high fiber, high protein and a healthy amount of Omega-3s are desired.